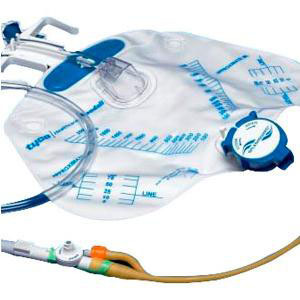 Mono-Flo Anti-reflux Device Foley Tray w/ Safeguard Needleless Sampling Port and Splashguard II Drain Spout includes: Ultramer Foley Catheter (Latex), 14Fr., 5cc, 2-way, 17" Curity Drain Bag (6308), 100% Latex-free Standard Prep Tray includes: (Sterile CSR Wrap, Fenestrated Drape, Underpad, Nitrile Exam Gloves, Forceps, Prepping Balls, 10cc Prefilled Sterile Water Inflation Syringe, Unique Bellows Lubricant Syringe, Povidone-Iodine Solution, Specimen Container and Label). Includes Splashguard II drain spout and #6208 2000ml drain bag. Safeskin Purple Nitrile Exam Gloves.